Sometimes we simply cannot see the flaw in our research design. It happens to the best of us. Lauren Seubert ('15), who is majoring in Economics and Applied & Computational Mathematics & Statistics, learned that the hard way. The real trick is to be able to identify the flaw, learn about it, and then adjust accordingly. Lauren did exactly that, thereby turning what could have been a failed trip to Norway on a Senior Travel and Research Grant into a successful one. Read all about it in her own words! My experience in Norway not only bridged the gap between my analytically focused coursework and my desire to exercise my skill set in a field work environment, but it also led to personal development by forcing me to adapt to unforeseen obstacles and constantly update my project’s hypotheses. Prior to traveling to Norway, I spent many hours creating and refining a survey designed to measure various aspects of social capital; I then planned to use this survey as my data gathering instrument. Unfortunately, this method did not work well in Oslo, Norway. I believe the bad stretch of weather during my stay contributed to people’s respectful but negative disposition toward taking my 5-10 minute survey on the spot using my iPad. I was discouraged, but after discussing this outcome with my Norwegian contacts I learned why: Norway is generally an introverted society. Many Norwegians are trusting and communally centered, as supported by my survey responses, but they often times feel uncomfortable when approached by a stranger. A member of the university’s student union thought that this complex cultural norm might be an outcome of the transition that resulted largely from the economic success Norway achieved after discovering oil. In his opinion, this event not only marked the transformation of their economy from secluded and simple to one of novel global importance, but also affected society on a cultural level. Prior to the oil discovery, Norway’s history was tranquil and the Norwegian people were happy being left to their own devices. After the discovery, the Norwegian people felt a bit taken aback with the attention their country started to receive. While Norwegians may be extremely social and friendly amongst other Norwegians, they are still adapting to foreigners’ interest in their society. This discussion was extremely useful to my study in helping me improve and enhance my assumptions. Nevertheless, I was forced to adapt my study’s design going forward. I resolved to create a link to my survey that could be emailed and only taken once so that people didn’t have to take the survey on the spot. Additionally, I transformed my instrument into an interview transcript to be used with various contacts. These contacts included: members of the student union and other student organizations at the University of Oslo, social researcher Signe Bock Segaard from the Institute for Social Research in Oslo, and Dr. Ole Gunnar Austvik, a professor of energy economics and management at the BI Norwegian Business School. Although this was not my original design and the randomization factor of my data was compromised, I gained the benefit of engaging more deeply in conversation through this interview environment. For example, Dr. Austvik greatly augmented the explanatory case of strong institutions, a case made in many of the research papers I read, as an important factor in Norway’s success. He explained that this case was rooted in the rise of the hydroelectric sector in Norway, which occurred long before oil was discovered. It was during this time that Norway successfully and effectively built institutional consensus concerning their energy policy. Unlike the United States, energy policy was not a polarizing political question; rather, it was an objectively strategic one. Furthermore, Dr. Austvik extended this model to help me understand how this type of thinking has permeated Norway’s entire political sphere from international affairs to discussing the privatization of infrastructure companies. Norwegian society fosters an open forum of discussion thus allowing for the country to be flexible and adaptable while still proudly standing firm in their core democratically socialist ideology. I was fortunate enough that my Norwegian contacts further supported me in seeking out other resources and contacts during my week in Oslo. I now plan to continue to use these materials and expansive network of contacts to further expand my study. I will also conduct data analysis on the data I gathered. Under the recommendation from Dr. David Campbell, I purposely constructed my survey instrument using verbatim questions from two well-known social capital questionnaires that are used widely to do comparison studies across many countries. This plan gives me the opportunity to still parse valid data, albeit not taken by me personally. Overall, my experience was overwhelmingly positive. 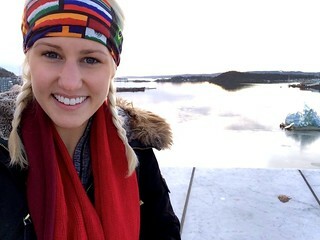 Not only did my project develop in ways I never thought imaginable before departing for Norway, but I was also blessed with the opportunity to immerse myself in an extraordinarily unique culture and meet wonderful people while doing so. Thank you to the Nanovic Institute for helping provide me with this amazing experience I will never forget!